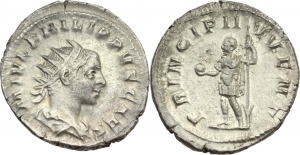 Lot 19609 - Philip II as Caesar (244-247). AE Sestertius, circa 244-246. Obv. M IVL PHILIPPVS CAES. Draped bust right. Rev. PRINCIPI IVVENT. Philip II standing right, holding spear and globe; in field, S - C. RIC, Philip I, 255a. C 55. AE. g. 17.02 mm. 29.00 VF. Lot 19897 - Philip II (246-249). 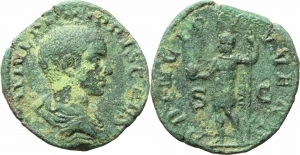 AE Sestertius, 244-249. Obv. IMP M IVL PHILIPPVS AVG. Laureate, draped and cuirassed bust right. Rev. AEQVITAS AVGG SC. Aequitas standing left, holding scales and cornucopiae. RIC 166a. C. 10. AE. g. 18.49 mm. 29.60 Good VF/VF.